You can make them healthy or indulgent, plain or fancy. But no matter what style you choose to make, these will be delicious fresh or out of the freezer. 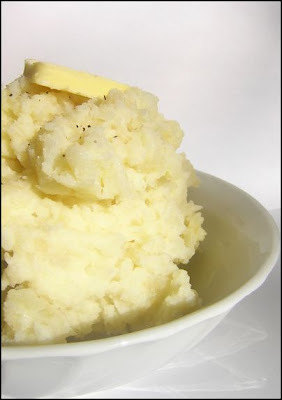 In a large pot of boiling, salted water, cook the potatoes until they are fork tender. Drain. Allow potatoes to cool completely. Put into airtight containers or a covered baking dish and refrigerate for up to two days or freeze for up to two months. Allow potatoes to defrost overnight in the refrigerator. Bake in a preheated 350 degree oven for approximately 30 minutes or until heated through. Give them a stir about halfway through and add more milk for a lighter consistency. Creamy and indulgent: Cut the milk down to 1/2 cup and add 1 cup sour cream and 6 oz of creamed cheese at room temperature. A hint of onion: Subsitute onion salt for the table salt and add in some snipped chives after mashing. Wasabi mashed: Add in 2 to 3 tablespoons wasabi powder. Cheesy mashed: Add in 1 cup shredded Cheddar cheese. Homestyle: Substitute 5 lbs red potatoes. Scrub them well and leave the skins on. Undermash slightly so there are still some discernable chunks. Healthy: Substitute 4 tbs margarine for the butter. Use skim milk. Add in Molly McButter or Butter Buds to taste.